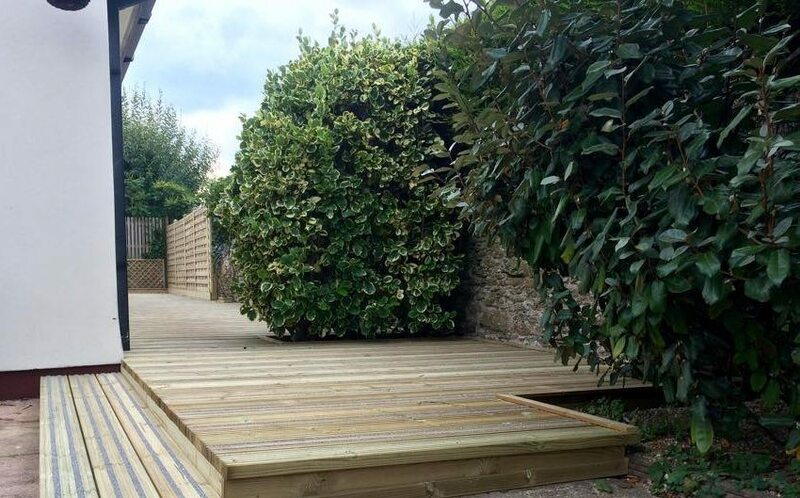 The Premier Grit Strip deckboards are equally suited to domestic or commercial sites. These low slip boards are popular on walkways, ramps, balconies or steps that are exposed to heavy foot fall. 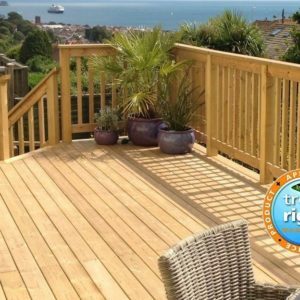 The grit strip boards use our Premier decking boards, making them compatible with our most popular “Premier” deck board range. 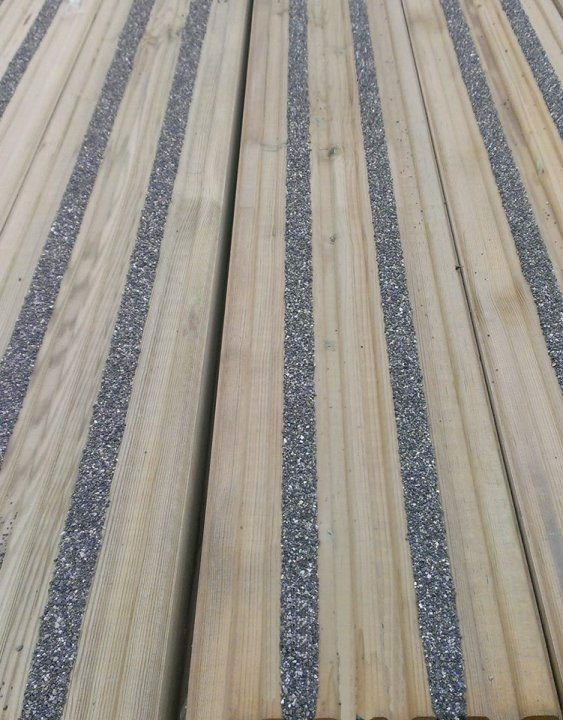 Both the grit strip and Premier redwood deckboard are ex-38mm x 125mm (approx. 32mm x 122mm finished size). 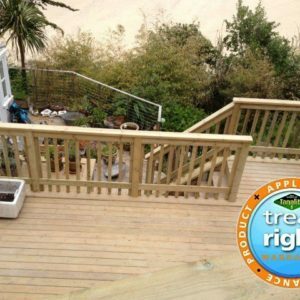 They are complemented by our other redwood balustrading products – spindles, hand/base rails, newel posts etc. These boards feature two strips of factory heat cured resin with aggregate for maximum grip. Because they are set within the deckboard grooves the aesthetics are improved while maintaining slip resistance. The two outermost grooves are left empty this allows for a firm and secure fixing to the joist framework. 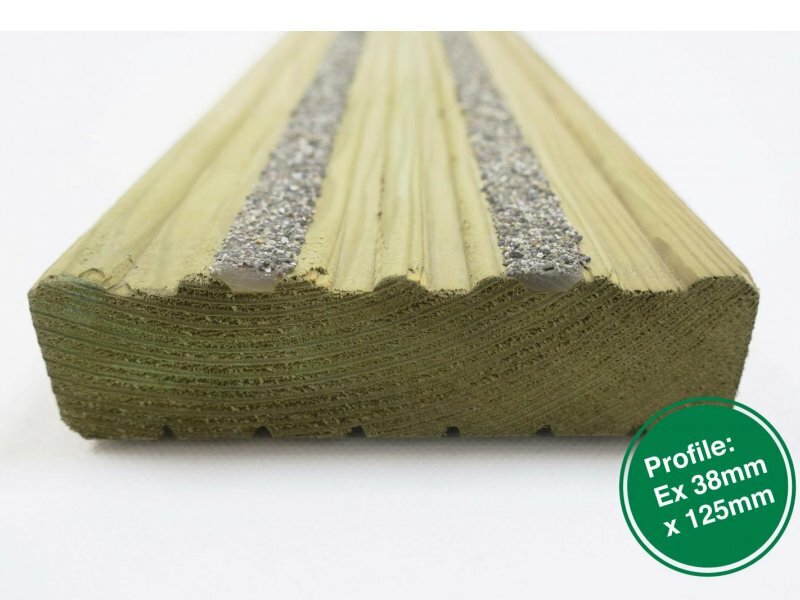 Premier grit-strip boards are normally available in 4.8 metre lengths. This makes them ideal for use as 900mm or 1200mm stairs treads. These anti-slip deckboards may vary in length, occasionally we receive 3.6 metre boards. Alternatively they can be used as full lengths as part of the deck. They can be alternated with our regular ex-38mm Premier deck boards if required. The grit strip boards are durable and solid, they are best cut using an old chop saw blade or angle grinder. Timber exposed to sunlight, rain and frost will inevitably change appearance very soon after fitting. 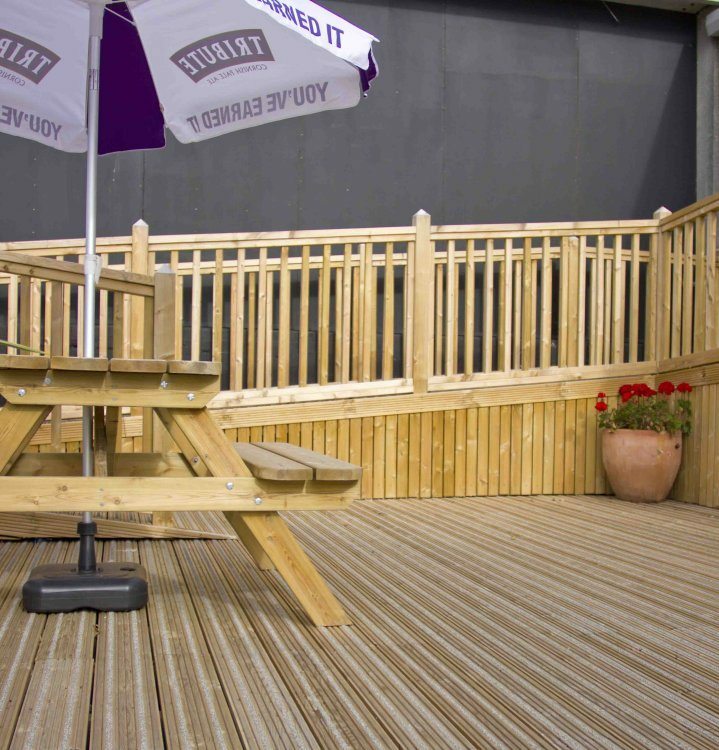 Whether the decked area is in a domestic or commercial setting it will need some maintenance. We would advise annual cleaning as a minimum to maintain appearance and increase service life. 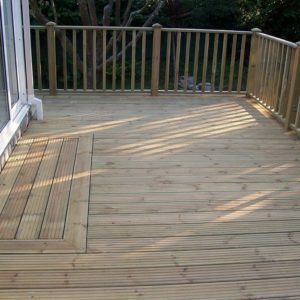 The deck boards can be cleaned with a combination of a thorough brushing with a stiff brush. You can also use a gentle pressure wash, keeping the nozzle at a distance. Blasting at high power at a short range will damage the timber surface. Annual maintenance will help to prevent algae growth, but areas that don’t receive sufficient sunlight may need two treatments a year. If required we stock Osmo Reviver Gel, this helps remove more severe cases of algae growth. 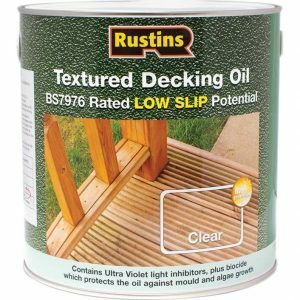 We also carry a range of Osmo, Rustins and Liberon deck oils, stains and other slip resistant coatings to help maintain your deck.